I was invited to a panel discussion at MICA, Ahmedabad (MUDRA Institute of Communication) as part of the National Seminar on Ecology, Communication and Youth: An ICZMP initiative at MICA campus, Shela, Ahmedabad from February 25 – 27, 2013 organised in partnership with, Gujarat Ecology Commission (GEC). The participants were NGO's and Field workers who are all youth from across the country, ecology and communication scientists and researchers and I was asked to speak in Hindi, which I did. The speakers at my session were scientists from ISRO, SAC and International expert in disaster management and the title of the session was Science and Arts for Managing Coastal Resources and as usual design was missing from the session title. My paper that I presented at the seminar is quoted below and the visual presentation can be downloaded from this link here as a pdf file. I did not stick to the text submitted below but I did vent my thoughts on the disparity in funding and support from the Governemnt of India as well as the States for science and technology when compared to design although the premier Institute for design has now (finally) been accorded National recogntion by the Union Cabinet with the status of an Institute of National Importance. The scientists present at the seminar conferred with me and in response to my enquiery told me that the SAC gets about Rupees 600 crores a year and the parent organisation ISRO gets Rupees 6000 crores per year as their annual budget support for the year. Add to this the Rupees 5000 crores per year that is given to the CSIR and many hundreds of thousands more to defence and other sectors in the name of technology you will see that there is a complete absence of support for design in comparison. My stated position is that our country will not be able to solve its critical problems if this kind of disparity of funding continues in the future and I hope this message is heard and acted upon by the Finance Minister in his forthcoming budget or in a followup action when the matter of design as an activity of national importance is brought before the Indian Parliament, hopefully soon. 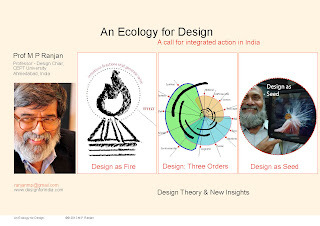 For me the seminar at MICA that will focus on the ecology of coastal Gujarat is an occasion to reflect on the terms – “Ecology” as well as “Design” – since both of these for me are central for understanding the world as a system and not as a collection of parts that we most times tend to do in order to achieve administrative convenience. The word Ecology is perhaps well understood by this gathering as the overarching processes of nature that includes the scientific study of the relationships that living organisms have with each other and with their natural environment. It alludes to the manner in which the various parts of the natural environment relate with each other and contributes to the sustainable survival or demise of the whole system. My definition of the word Design, however, may not be generally known nor accepted easily since we all carry so many versions for this particular word. So let me state it here in brief to explain my arguments further. Design is a discipline that uses all the disciplines known to humanity in order to build a synthesis of new offerings –settlements, products, spaces, services, activities as well as organizations – for the betterment of our society and to meet their aspirations, needs and desires with the natural and cultural resources that are available and accessible at any given time and place. Over time, what we build tends to shape us and all that we think and do. I have used the metaphor of fire to define design using a model that was developed with my students. When we look at fire we see that it has various components — Fire (Agni) is a process of transformation — a material is transformed by organic exchanges with the environment and an effect is the product of this exchange. The process is always situated in a particular context and this context is represented by the ground on which stands the fire, both time and place taken together form the context. The process of burning and the products of light, heat and smoke are all in close interplay with the environment and design too is an activity that can happen only with reference to its own context. This fire therefore represents the kind of complex transaction that I consider an adequate expression for the systems metaphor for design. This means that we see design as a complex activity. There is not a single product that we can call a simple product. Take for example the simplest of products that you can think of and explore its possible effects. If you look at it only as a product of technology, that is, as some material transformed into a functional shape, then it would seem to be simple. However if you consider its entire life-cycle and its impact on society, it is quite another matter altogether. So it is becoming increasingly evident that design has to look beyond the object itself as a mere artifact, as produced by technology, to the effects that these objects have on a complex set of user-related parameters and finally the effects of these objects on the environment and culture at various stages of their life cycle need to be taken into consideration while we design them. This leads us to re-evaluate the role of design and to anticipate the shape of the design activity in the years to come. We are beginning to understand the complex nature of design, which means that you also need a fairly complex method of dealing with it. Design methodologies need to be reevaluated and innovated to cope with this complexity. A lot of technological development in recent years has created negative results, some with catastrophic consequences. We are certain that the exploitation of technology without the use of design processes that take cognizance of the long term needs of users and environments will lead to disaster. We can call this an ecological view of design when we are attempting to deal with the complexity of both natural systems as well as how they connect and are influenced by human interventions and activities. In a paper that I had presented in Istanbul in 2009 titled:” Hand-Head-Heart: Ethics in Design” I had proposed a new organization of our understanding of the design activity as the three orders of design. This level of design is recognized by most people and is the commonly discussed attribute. Here material, structure and technology are the key drivers of the design offerings as these help shape the form that we eventually see and appreciate in the artifact. We can appreciate the offering as an honest expression of structure and material used and transformed to realize a particular form that is both unique as well as functional. It is here that skill and understanding of the craftsmen are both used to shape the artifact through an appropriate transformation with a deep understanding of its properties and an appreciation of its limitations. This level is influenced by utility and feeling of a society and is largely determined by the marketplace as well as by the culture in which it is located. Here aesthetics and utility are informed by the culture and the economics of the land. We can sense and feel the need for the artifact and the trends are determined by the largely intangible attributes through which we assess the utility and price value that we are willing to accord to this particular offering, which is quite independent of its cost. This level is shaped by the higher values in our society and by the philosophy, ethics and spirit that we bring to our products, events, systems and services. At this level value unfolds through the production of meaning in our lives and in providing us with our identities and these offerings become a medium of communication in themselves, all about ourselves. It is held in the politics and ethics of the society and is at the heart of the spirit in which the artifacts are produced and used in that society. There are deeply held meanings that are integral to the form, structure as well as some of the essential features which may in some cases be the defining aspects of the offering, making it recognizable as being from a particular tribe or community. These features define the ownership of the form, motif or character of the artifact and these are usually supported by the stories and legends about their origin and give meaning to the lives of the initiated. I do not have much time to elaborate these positions and provide all the case studies that we have gathered over the years. These are described in my previous papers as well as on my blog – “Design for India” – and can be accessed from there. However this presentation will not be complete without stressing that we need to build a suitable ecology for design itself to flourish here in India since we seem to have adopted specialization as our preferred approach to dealing with problems as and when they crop up while relegating the organized integration of these special knowledge and tools to chance encounters of committees that we put together to manage these events as they come to our attention. On the other hand we speak of public private partnerships where we place these actions in the hands of some entrepreneur who is supposed to first create these new offerings by inventions and also “jugaad” without the benefit of a nurturing environment on which these activities can take place in a sustained and effective manner. India needs to reconsider its approach to design and to recognise design as an ecological offering that has many layers and relationships and also to set up processes and organisation that can use that language and tools of design to transform our society and the environment on which they live, work and play. We will also need to look at the manner in which design can be integrated into all our activities and not leave them as domains of specialist activity as they have been in the past. For this to happen we will need to look at how design is being taught in our schools and institutes and how these will change to accommodate the new understanding of design that we now have arrived at through our various journeys and from the crisis that some of our past actions have created at the level of the ecology, while looking at the health of the whole and not just the parts. His blog “Design for India” has become a major platform for Indian design discourse.